Back to normal.... After sooo many months. I am now sewing weekly again with Miss Khrissy yay!!! We have decided to finish A Christmas Story from 2012 shhhhh and then we will join sooo many others and do Gossip In the Garden as our next BOM. 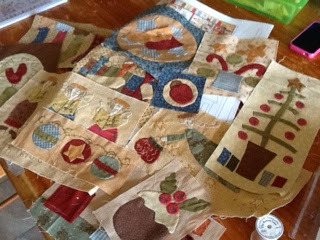 I have one more block to needle turn and a couple to back stitch, a few more weeks and I'm hoping it will be finished. Your blocks look great Deb. Can't wait to see the top put together. Oh good news. So glad to hear things are getting back to normal. That's fantastic deb... So pleased for you! that is the best news..........leg all good now???? Great news Deb.....happy, happy, happy! Join me for Friend Night with Friends!